The Reserve on West 31st has some of the best KU student apartments in Lawrence. 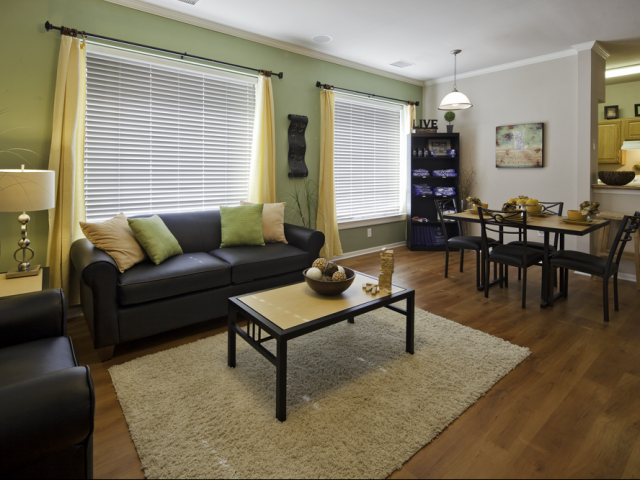 Our community offers spacious housing that’s loaded with amenities and only minutes from campus. In fact, we’re located along the KU bus route! Every apartment has 3 or 4 bedrooms, 2, 3, or 4 bathrooms, a kitchen with a dishwasher, open living and dining areas, and roomy closets. Apartments are also fully furnished and come with their very own washer and dryer, making move-in easy and saving you money. As a community that caters to students, it’s important to provide quiet spaces where our residents can study and do homework. That’s why we have several study rooms and a computer lab with free printing. When you need a break from schoolwork, we have tons of amenities to help you relax and blow off steam. In addition to free Internet in every apartment, we have a pool table lounge with a TV. Plus, you won’t have to buy a gym membership as long as you live here thanks to our 24-hour fitness center, basketball and volleyball courts, a swimming pool, and a hot tub. Now that you’re more familiar with our apartment community, check out our photo gallery and videos, then contact us to schedule an appointment with our leasing staff. We’re happy to give you a tour, discuss pricing and availability, and answer any questions you might have. But don’t wait. The Reserve on West 31st has some of the most popular KU student apartments on the market, and you don’t want to miss out on this unique living experience!